As DJs, Australians the Stafford Brothers have possibly entered a league of their own and as producers, the boys have new releases out on CR2, Stealth, Flamingo, Discowax/Sony, Ego & Ministry of Sound and remixes of Roger Sanchez/Sidney Sampson, DJ Fresh, Mark Knight/Dirty South, Dominatorz & Bassmonkeys, Snoop Dogg/Akon. In 2011, the Stafford Brothers where asked to rework the official theme song of (arguably) the biggest sporting team in the world, Real Madrid. ‘Everybody’ (Hala Madrid) was released to over 26 million Real Madrid Facebook fans and features the stars themselves in the film clip. They were the only Australian act confirmed as headliners for March’s Future Music Festival Main Stages (30,000 people) and recently completed a string of live dates through Miami, Canada, Dominican Republic and made their debut @ Ruby Skye. In January 2011 Australia’s biggest cable television network Fox8 premiered Season 1 of ‘The Stafford Brothers’, the first reality and music TV show about DJs. Hundreds of thousands of viewers tuned in as dance music was taken to a new level. Camera crews followed the Stafford Brothers, family and management across Europe as they ventured into the heavyweight leagues of Ibiza and beyond. As the show’s ratings continued to hike each week, so did the realisation that The Stafford Brothers are a dominant force on the move. The last episode of Season One aired to massive numbers, and in that same week the boys boarded a plane for Miami embarking on a 35-date world tour, which saw the guys on the road for 80 days. Season 2 of their TV show launched on January 27, 2012 - a brand new 10-episode series following the dynamic duo - and is supported by a soundtrack on Ministry of Sound which features original productions and remixes from Arty, Bingo Players, Chuckie, Dada Life, Dirty South, Kaskade, John Dahlback, Laidback Luke, Tommy Trash and The Stafford Brothers, among others. Now, The Stafford Brothers have relocated to Los Angeles and they’ve brought their camera crew with them. The third season will be filmed in North America and nothing’s off limits. The cameras will be following the boys along their entire journey and it will provide the most intimate look at a DJ’s life – from the down time, behind closed doors and the moment when the party gets started – it’s all there. 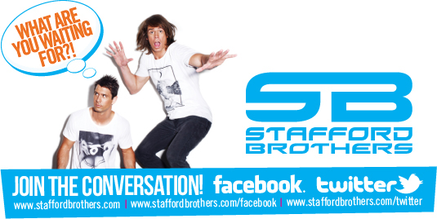 This reality show is unscripted with the Stafford Brothers and dance music providing the compelling storyline in a real life setting. The Stafford Brothers won’t have long to settle in as they’ve recently struck a residency deal with Marquee Sydney and TAO Group America that will take them through the popular dance brand’s finest properties in Sydney, Las Vegas and New York City. The residency begins in Sydney on June 9th and launches in Las Vegas on June 22nd at Marquee Nightclub.